Dark Aoud is a popular perfume by Montale for women and men and was released in 2011. The scent is woody-spicy. Projection and longevity are above-average. It is still in production. Bats are black, fly only during the darkest hours and squeal in such a way that your blood freezes. Blackbirds are black, fly only during the day and sing like a nanny cradling a baby. If you take a can of Montale's Dark Aoud aiming at bringing home a bat, wou may get a blackbird instead for you to deal with. - It has got "Dark" in the name. - It has got (A)oud in the name. - It has got Oud, Black Pepper, Leather, Sandalwood and Vetiver qnd other notes. I was not expecting to buy an "bully ugly vampire bat" like Swiss Arabian Dehn El Ood Malaki. But I was quite far from imagining that this fragrance darkness was closer to Disney's ugly duckling. Now that I gave rein to my disappointment, let me tell you that Dark Oud is a very nice Oriental Oud fragrance. It's just a typical Montale western Oud well designed fragrance, trying to please a lot of oriental scent lovers and really not caring about using a misleading name to fool a bunch of Trolls that prefer to smell dark caves rather than flowering forests. I am included in that bunch of Trolls. You may tell me that it isn't so but in my opinion Dark Aoud is ment for Hobbits and Dwarves, not for Orcs and Trools. I do think that this fragrance is more "sandalwoody and leathery" than "oudy". That's just an opinion and I like the heavy sandal and leather as well. The scent is quite linear - that's not a defect - with a bit of an evolution towards the sweet during the dry down, maybe due to olibanum or incense even if those notes are not listed. In summary it's a very agreable wearable oriental woody fragrance with some very good quality ingredients, an above average performance and with the traditional Montale's golden can presentation. Remark - I have the recent golden bottle and not the older one with black circles over gold. Probably the juice has been reformulated and watered down together with the current only gold color can release. I may be anosmic to some components (I am very skeptical about “selective anosmy”, though) but I don’t get anything “dark” here, not even by mistake. 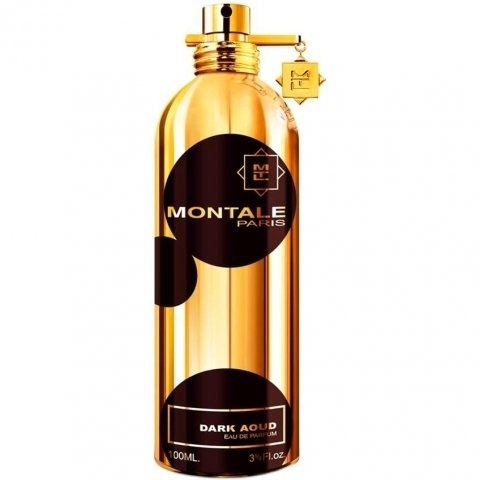 And no oud either, but that’s no surprise with Montale offerings. Dark Aoud seems to me a very inoffensive, quite pleasant, slightly boring and extremely artificial cedar-sandalwood scent with a polite, understated, mannered dry look – almost minimalistic, in some way. It feels very clean, slightly earthy-herbal too, with a mild touch of spices to add a delicately sparkling edge to the core woody galore. That’s it. No oud, not even a synthetic hint of that, and no darkness for me, at all. Quite the opposite, actually (you know what scent Dark Aoud reminds me of, if any? A Quiet Morning by Miller et Bertaux). Despite the criminally misleading name and a certain feel of flatness it’s a decent scent though, almost nice - a very clean and discreet everlasting woody blend with no particular sparks of interest, but effortlessly enjoyable. A very safe and versatile workhorse, I guess. One of those clean, generic “IKEA-like” woody scents, just with some spices and an eau de parfum strength and longevity. Not exactly the catchiest scent around and definitely overpriced, but there’s worse than this. A rather linear (not a negative thing), yet beautiful blend of truly dark, somewhat medicinal aoud and sandalwood. Aoud lovers will almost certainly like this. I like it myself. I can imagine waring this in colder months of the year, and maybe at night, which in my opinion goes well with the dark mood the scent creates. I do not think Dark Aoud is feminine at all, but that does not mean ladies should not try... Longevity is great, projection is very good. Very interesting! Dark Aoud is one of my favorite fragrances. Obviously, the scent is woody and Sandalwood seems to stand out the most. As far as woods and Aoud, this one doesn't seem to be very harsh and leaves a very nice trail. Sillage and Longevity are outstanding. Don't overspray this one or you'll clear a room out. Only few words can describe Dark Aoud: heavy, dense, linear, raw. It's a very unidimensional scent: sandal, oud and musk from the beginning to the end. Also there's a tiny note of incense (maybe frankincense due to the small sweetness that appears after some hours). There's no comparision with other sandalwood bases fragrances: this is totally different. If i could compare, i would say Bois des Iles is a little small bird and this is a hungry hyena. Sillage, lasting power and projection are hazardous. One of the best Montale releases so far. When a piece of metal is cooled to well below freezing, say by dipping it in liquid nitrogen, it becomes capable of burning the skin, paradoxically enough. It's not really a burn but a freeze, but it has the same damaging effect and the pain is probably very similar as well. Upon donning Montale DARK AOUD, I was struck by the unbelievable density of this composition. It's so black that it could easily induce the olfactory equivalent of white spot afterimages. For a brief period, I was even struck by what seemed to be a dark shoe polish-like scent. This is incredibly woody, including oudy, but it is also very dense and thick, as though the wood has been compressed to one-tenth its starting volume. I initially thought that I was smelling the base of so many recent launches, and I do continue to believe that there is significant overlap with, for example, Le Labo ANOTHER 13 and Balmain CARBONE, but DARK AOUD pulls out all of the stops in its quest for absolute blackness, and the result is somehow better not worse. I suppose that I can tolerate this woodishness in an exaggerated dose because it's not clobbering everything else around. Why? Because there *is* nothing else around: no flowers, no fruits, no citrus, no sweetness or light--nothing mitigating at all. This is deep, dark wood in every form, from fresh hewn to petrified. To me, this is obviously a masculine perfume, and I'm not surprised to see that although it is classified as unisex, three times more gents than ladies own this prince of darkness.